THIS PAGE IS UNDER CONSTRUCTION. PRICES AND SCHEDULES SUBJECT TO CHANGE. You may pay in full, or pay $30.00 to reserve a spot, with the balance invoiced in monthly installments. If you are registering a week or less before the beginning of the term, the first monthly installment must be paid in full to reserve a slot. It is important that we have your contact information if we must cancel a class or change the time. There is a nominal one-time $2.00 registration fee. Babies from birth through two years old play interactive games involving familiar songs, rhymes, and rhythms. Activities are designed to stimulate cognitive development. Children use familiar folk songs to learn principles of rhythm and pitch. 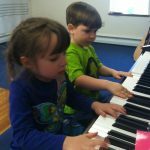 Through singing, dancing, and the playing of rhythm instruments, children lay a foundation for further music study. Prereading skills are incorporated in drawing and coloring activities. 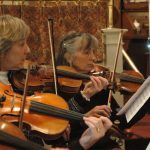 An introduction to string playing for beginning students. Fee includes instrument rental. Instrument may be taken home to practice between classes. Children will learn the basics of playing guitar, including correct left and right hand positions. Basic music and chord reading is also included. No prior musical experience necessary. Mary introduces exercises designed to promote good vocal technique without intimidating singers. She chooses repertoire for singers, and sometimes singers bring their own songs to polish. Accompanist provided. A week-long experience in playing classical music as a group. All orchestral instruments welcome. 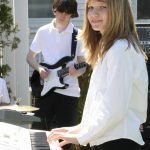 This group playing experience will teach players to improvise over blues forms while playing through many of the most enduring old blues standards. Instruction will include music theory, ear training, and some music notation. Attendees should have basic playing skills on their instruments, and players of all types of instruments are welcome. In Mountain Top’s popular summer jazz lecture series, Mike Sakash will explore the eventful year 1959, when some of the greatest jazz recordings were released. Location available soon!